Slave shirts may seem obviously wrong but some people thought it was a good idea. After receiving online criticism, ASOS removed the slave shirts from its online marketplace. 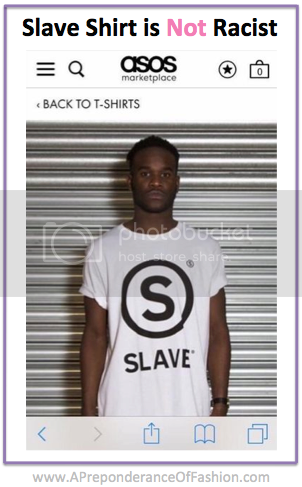 The slave shirts are not actually manufactured by ASOS; the shirts are made by Wasted Heroes (the brand is online but I refuse to give the company any link cred). Wasted Heroes made a comment basically admitting that the slave shirt was in bad taste and was supposed to be a comment on people being slaves to brands. Who knows, maybe the self-described “bold & brazen street-wear label with an identity of its own” wasn’t trying to be super provocative to attract attention. This bold move is fashion law approved under freedom of speech so long as the label is narrowing its audience to skinheads. The slave shirts are NOT racist. The makers, distributers, and purchasers… ehhh… arguably so. Or at the very least intolerably insensitive. Shirts are articles of clothing. Clothes cannot be racist by means of verb, noun, or adjective. Some people had a problem with the shirt being on a Black model. For me that was not the big problem. People are still trafficked as slaves and slavery is not limited to one race or skin color. The model wearing the shirt reminds me of a Katt Williams skit. In the skit, Williams referenced his participation at the roast of Flavor Flav. Williams starts off saying he was told that other participants would have a script and that he would be responsible for his own. When Williams saw these lines he was upset and retreated to his dressing room. When he came out for the show and saw Flavor Flave in the contraption, Williams followed his script. Should people feel mad or sorry for the model? Williams says he was mad at himself for actually going through with the race-focused line. But he also says that he continued participation at the roast because of how much he was going to be paid. Makes me wonder if this model faced a similar situation where he was possibly excited to book an ASOS shoot and/or get the money for the modeling gig so much so that he just went along with it. Or did he feel powerless? I wonder what the fashion law contract between the model and ASOS included. ASOS has an online marketplace where it allows individual designers and small companies sell their own goods. Sellers must agree to ASOS marketplace’s terms and conditions when they join. These terms cover liability, indemnity, and lack of agency between ASOS and the sellers. If a fashion law case were brought against ASOS, this contract would cover the company from guilt arising from the acts of sellers as well as having to pay legal fees if necessary to clear itself. But the ASOS brand itself could be damaged. Many people who were discussing the slave shirt and sharing the screenshot of it from the ASOS marketplace failed to mention that the slave shirt was not manufactured by ASOS or placed for sale by ASOS. It seems likely that many people did not realize that ASOS was not the brand that thought it was a good idea to sell slave shirts. Although ASOS was quick to remove the slave shirts and explain that it was placed for sale by the manufacturing brand, ASOS’s brand and reputation could still be tarnished. Clear contract terms are not enough. Branding is critical. ASOS would be smart to add a byline under its logo that clearly explains there is a separation between the ASOS store and the ASOS marketplace. This way shared screenshots of questionable products would be clear to people who otherwise would think “asos marketplace” is the online store for ASOS. Great piece. I disagree with your fashion law takeaway tho. You may be on the right side of the argument in a court of law, but in the court of [my] public opinion ASOS has to accept the good with the bad. They benefit from showcasing and housing these products in the ASOS marketplace and thus should share in the scorn when a distasteful product makes its way on to its digital shelves. Perhaps a better protection of the ASOS brand would be to rename the marketplace instead. That way the association wouldn’t be immediately apparent. But my guess is they’re capitalizing off the association in the first place. In which case, as I stated above, take the good with the bad.